Processions of the faithful take place night and day in Lourdes. It is said that when the Virgin appeared to Bernadette Soubirous at the Massabielle Cave, she made three requests: drink and wash in the spring, have them build a chapel here, and invite people to come in procession. Daily processions (most of the year—check with the Information Center for specific schedules) fulfill that request. At about 5:00 PM the Blessed Sacrament Procession goes from the Esplanade in front of the Basilicas to the Basilica of St Pius X. 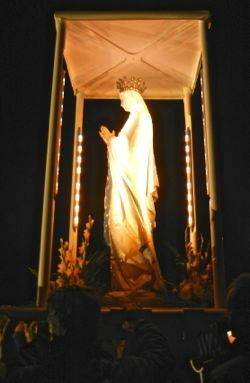 The more dramatic takes place at about 9:00 PM, when pilgrims join the Torchlight Marian Procession from the Meadow (just across the river Gave de Pau from the Massabielle Grotto) to the Esplanade in front of the Santuaries of the Immaculate Conception and the Rosary. Hundreds, sometimes thousands of people process, winding down the street, past the giant rosary and the crowned statue of the Virgin, to the top of the avenue, and then turn and process back to the Esplanade, where they line up in front of the sanctuaries. Those in wheelchairs or otherwise unable to process assemble in front of the sanctuaries. Other pilgrims and tourists stand on the ramps leading up to the Basilica, filling the ramps with light. 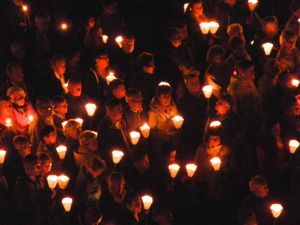 The picture above was taken from the top of the ramp, looking down on the Esplanade at the throngs with their candles. A group of people carry a well-lit statue of the Virgin at the head of the procession. When they reach the Esplanade, they bring the statue to the top of the Rosary Basiica and display it in front of the golden crown. The rosary is recited in at least six or seven languages, reflecting the international attraction of Lourdes. Candles are readily available and everyone who wants to carries one. The procession is particularly dramatic on a clear night, with a full moon, such as we experienced. 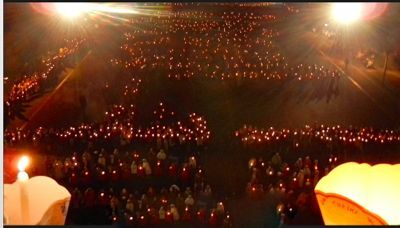 Above, Pilgrims with their candles, Lourdes, France. Below, Statue of the Virgin Mary, carried through the procession and to the sanctuaries.